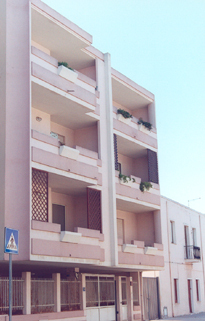 L' appartamento si trova nella via principale di Assemini al terzo piano di un piccolo condominio. E' costituito da due camere da letto ( matrimoniale e cameretta) un bagno, ripostiglio, un soggiorno ampio e angolo cottura. Sono presenti due terrazze di cui una coperta e collegata con la zona giorno. Il tutto e di recente costruzione, è completamente e gradevolmente arredato, frigo,freezer, forno, microonde, tv, lavatrice, riserva di acqua, ascensore, posto auto al coperto, cancello automatico, il bagno è ampio ed è fornito di doccia, è condizionato in tutti i locali con un sistema di pompa di calore autonomo. La biancheria letto, bagno, cucina i consumi e pulizie finali sono incluse nel prezzo. Si gradiscono soggiorni minimi di due notti. The “Le Ginestre” is a nice apartment located at 3° floor in a small and calm co-owner of 6 families in the principal street ( via Carmine 194) of Assemini(Ca) “The city of pottery”. Have 70 mq, with two bed rooms, bath-room, one Kitchen and dining room, two verandah, lift and place for car cover. In kitchen ther's refrigerator with ice-chamber, oven , and all for to cook. In dining-room ther'are two sofà, TV in a agreeable atmosphere. Bath room is large, ther's a shower bath. Into, and in veranda there are plants and flowers, ther's a good view in the country. The flat is conditioned in alls room, with indipendent system of cold/warm. Near (100mt) there are, market, bar, Pizzeria, restaurant, hair-dresser, wine market. Assemini is a small city of 30.000 people, near Cagliari (10 minuts), Cagliari /elmas airport 5 minuts and is near at important roads to overtake sea and beach of Cagliari, Pula, Chia and Santa margherita, or in direction of south- of Sardinia, Costa verde, Sant' Antioco, Carloforte, archeological places : Barumini, Nora, Montessu, Thophet of Monte Sirai and Sant' Antioco. Another you can see Oristano, Tharros and Sinis in one hour. If you prefer Assemini is a city .....for dancing, disco, pub, restaurant and pottery. The complexive cost is” full-included”, lingerie for bath-bed and kitchen ( with week-change), conditoned air, gas and all consumptions. To Start by Cagliari,( for Assemini), choice Cagliari airport, indications SP Iglesiente 130, direction Elmas/assemini/Decimo/Iglesias. to continue , at first semaphore active( the first is not active)* to rotate at left, continue and at another first semaphore to rotate at rigth, after Elmas (2 Km) you are in Assemini, the street is via Carmine, after a big marke t(on the rigth), one restaurant Maratoneta(on the rigth), one Gym(on the rigth), at number 194 on the left ( culurgioni/Cabula) there is “Le Ginestre” . •	If you prefer to rotate at second semaphore ( street 130 direction decimo-Iglesias)on the left, continue in” via Sardegna” as far as the big rotative, (to rotate rigth, left ) direction Elmas and run “via Carmine”, after Hotel Grillo, a gasoline service(rigth) a small Cherch, one pizzeria, at 194 number on the rigth ( culurgioni/Cabula) there is “Le Ginestre” .